Candy and Nut Assortment is a gift to please everyone. 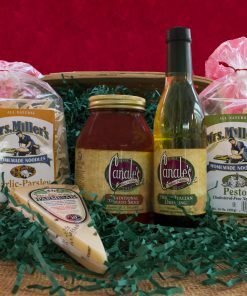 Great for parties, events, or just around the house for snacking. Choose between nut, candy, half and half or any combination. The nuts may consist of honey cinnamon almonds, salted mixed nuts, salted cashews, salted/ roasted peanuts, and salted pistachios . 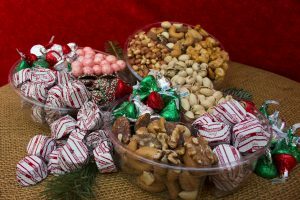 For the candy lovers, your tray may consist of nonpareils, cinnamon JU JU bears, Reese’s pieces, Chocolate covered Almonds or Chocolate Bridge Mix. Remarkably, nuts not only taste great, but they’re loaded with protein, fiber, and essential fats, which also makes them great for you. It seems like every day more and more studies continue to be released showing the health benefits of eating nuts as a fundamental part of your diet. For the one with a sweet tooth add an assortment of candies to your gift. Chocolates are every ones favorite and for the kids in the bunch add some gummi bears or chocolate covered malt balls.